One of the earlist sophisticated maps of Malaya. Shows regional polities. Nieuwe Kaart van het Eyland Sumatra verbeterd door Francois Valentyn. Possibly the most beautiful printed map of Malay ever made, this is a superb example of Francois Valentijn's 1726 map of Malaya (Malaysia and Singapore) and Sumatra. Oriented to the east, Valentijn's spectacular map covers from the Island of Junsalan (Penang / Prince of Wales Island / Pulu Pinang) south as far as the Straits of Sunda and west to Atsjien (Banda Aceh) at the western tip of Sumatra. It extends eastwards to the Anambas Islands and the Bangka-Belitung Islands. The cartographer identifies various polities as well as numerous coastal settlements and cities. Topography is rendered in profile and limited submarine detail is presented in the Strait of Malacca. Valentijn's map is one of the first published to present a sophisticated treatment of Malays and Sumatra, and the model upon which most subsequent maps through the late 18th century were based. This is one of the earliest maps to expound upon the indigenous polities of Malaya. Valentijn identifies seven separate kingdoms within the peninsula. The presentation thus represents a major change in Malayan politics following the Dutch capture of Portuguese Malacca in 1606. The Dutch forged a peaceful arrangement with the Sultan of Johor, leading to a time of general peace and prosperity in the region. This prosperity, combined with the decline of the Sunnite of Aceh in northern Sumatra, allowed for the rapid development and expansion of smaller polities throughout the peninsula, These include Johor, Perak, Pahang, Patani, Kedah, and Ligor - the latter two of which, as noted here, fell under the sway of Siam. Valentijn moreover, has recorded some 80 place names in Malaya alone, and far more in Sumatra, far more than any predecessor had attempted. This map was issued in Amsterdam in Francois Valentijn's 1726 Oud en nieuw Oost-Indien . It was published by Joannes van Braam and Gerard onder de Linden, whose names appear on the imprint. Today this important map is very scarce. Very good. Crisp dark impression suggestive of an early strike off the plate. Original platemark visible. Left margin expertly extended where originally joined to volume. Minor verso repair same area. Blank on verso. Curtis, R. and Durand, Fr. 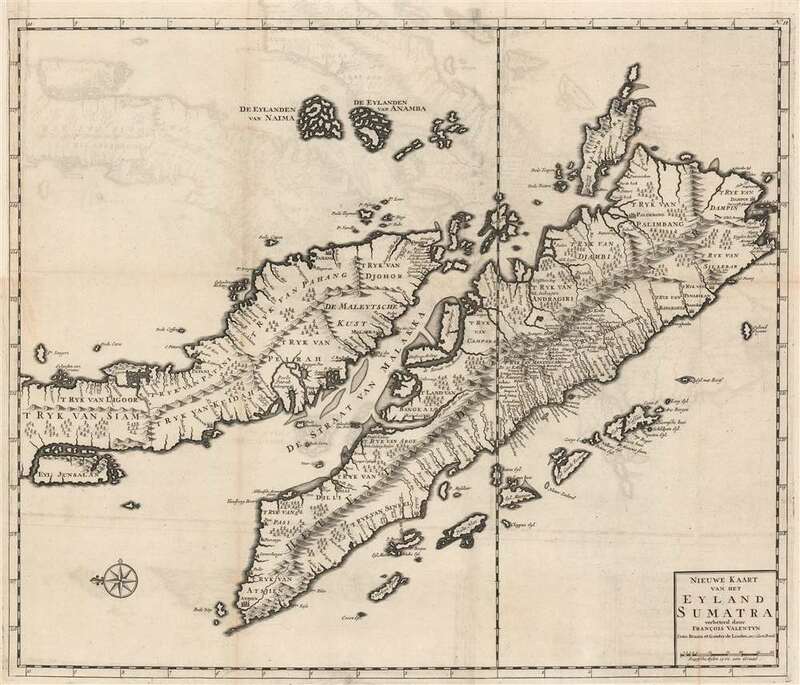 Maps of Malaysia and Borneo: Discovery, Statehood and Progress, pages 49-50, no. 38. OCLC 871359842.